Super Polish Pads are designed for buffing very soft finishes or for polishing soft waxes on wood floors. 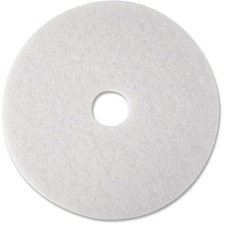 20" diameter, white buffing pads remove scuffs and black heel marks and enhance floor appearance. Each removes light soil and other contaminants. Use with rotary or automatic equipment for spray cleaning or dry buffing with low speeds from 175 to 600 rpm. Super Polish Pads 4100 are designed for light scrubbing. Each cleans without dulling the floor finish. Polyester fibers offer an open textured nonwoven construction. Polishing particles are dispersed throughout and bonded to the nonwoven construction with a durable adhesive. For use on low speed (175-600 RPM) rotary equipment.